Amish Wagon Works: Timeless Favorite for Your Favorite Child! 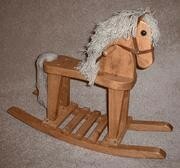 Remember how much fun you had as a kid on your rocking horse? Now how can give a loved child in your life that same experience with a Shaw Creek Rocking Horse! These American-made durable wooden horses are the almost as good as the real thing! They come in two sizes, 30 pound and 70 lb, and come with leather bridles and reins, synthetic mane and tail, and sturdy hand grips for greater stability. And for you draft horse lovers, you can order Shaw Creek Clyde, a Clydsdale Rocking horse with adorable "feathers" on each leg! ﻿Notice the draft horse build that Big Clyde features! Ready for that cattle roundup? Have a knight who needs a big horse? Get saddled up today!